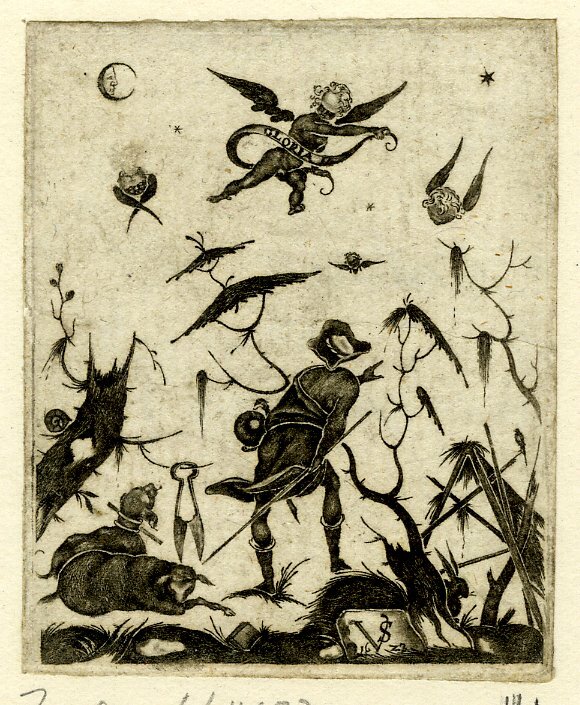 This image and the two below are from a series of seven plates of jewellery designs surrounded by small scenes, published by Jean Toutin in Châteaudun, 1618/19. Toutin (d. 1644) was a goldsmith, enamellist and ornamental engraver. 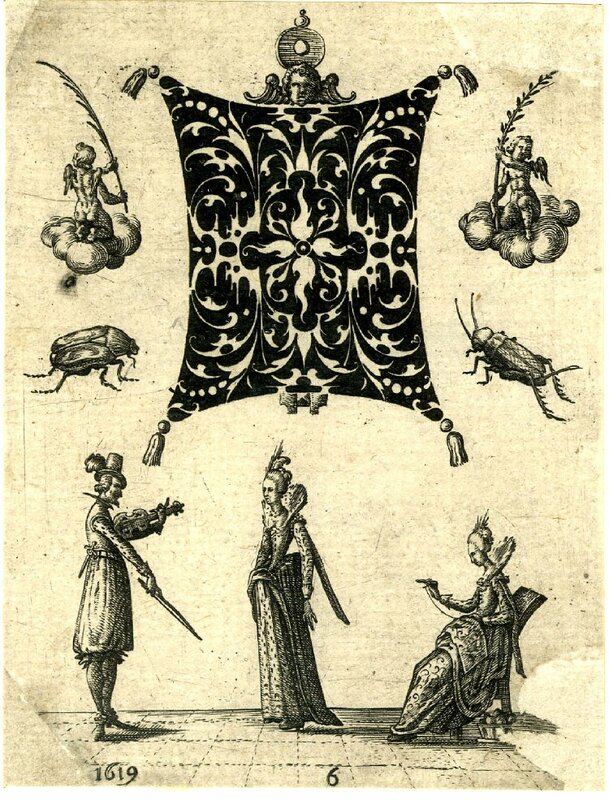 Cushion-shaped design in blackwork with pea-pods (cosse de pois) surrounded by two putti, a beetle and a grasshopper, and a small scene with a violonist, a woman dancing, and another woman embroidering. 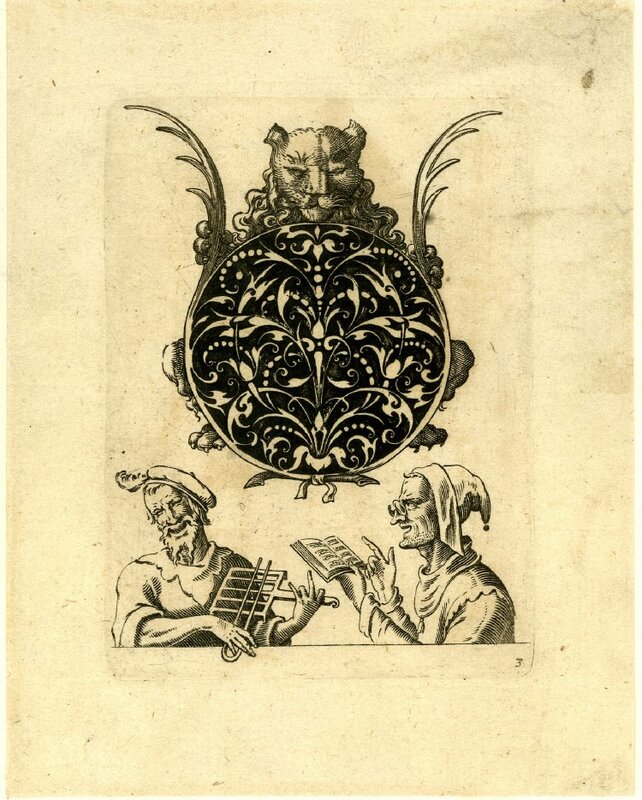 This print and the one below were made by Jakob von der Heyden, after designs by Jean Toutin. 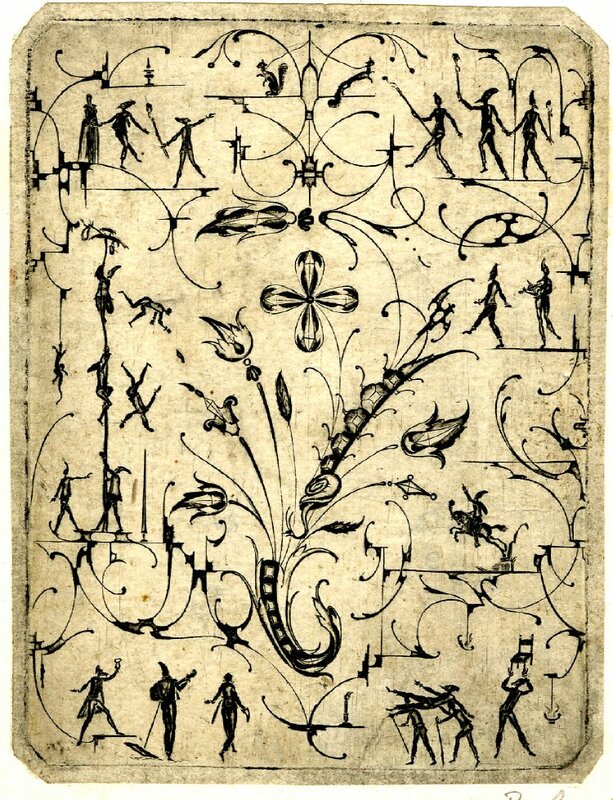 Heyden's 1630 suite of a dozen blackwork plates reverse copied a selection from two series of prints by Toutin (including the above examples from one set) published in 1618/1619. This is one of the less fanciful designs by Corwinian (Corvinian) Saur, who was influenced by the grotesques in mid-16th century books by the French architect, Jacques Androuet du Cerceau. 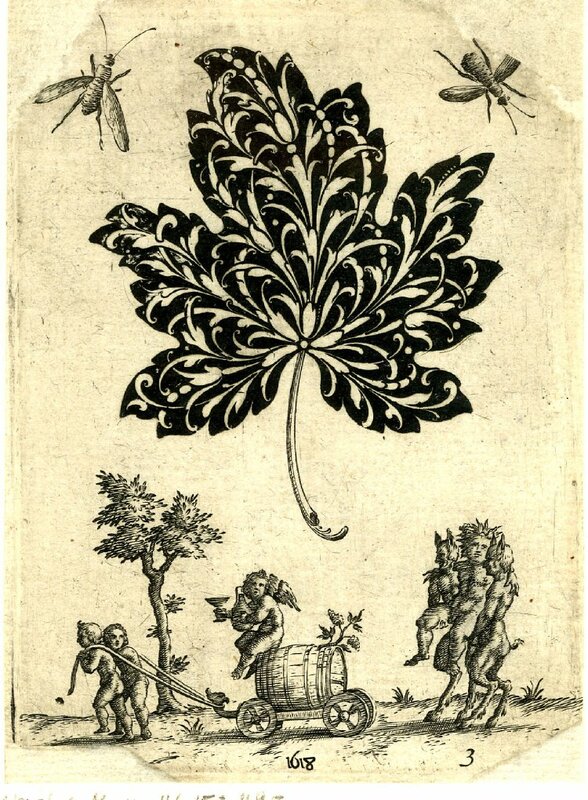 Grotesque panel, blackwork with small silhouetted figures, bandwork, foliage and flowers. 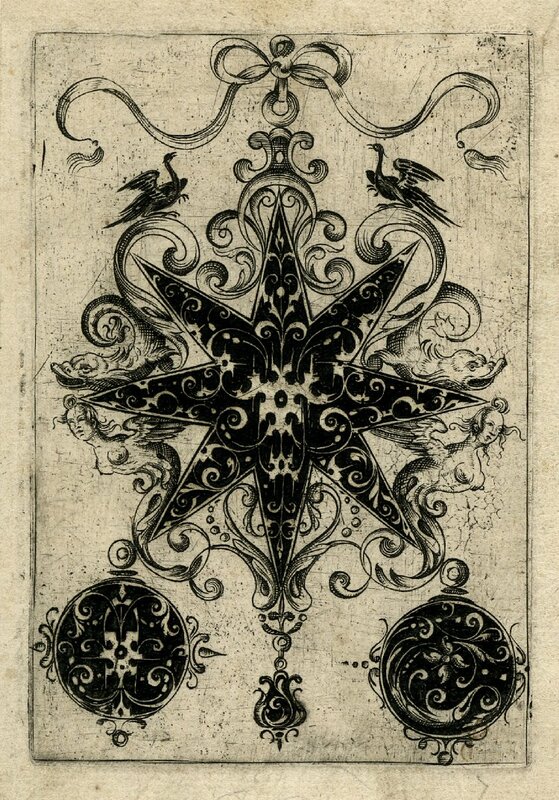 Designed and engraved by Matthias Beutler (Beitler), 1600. 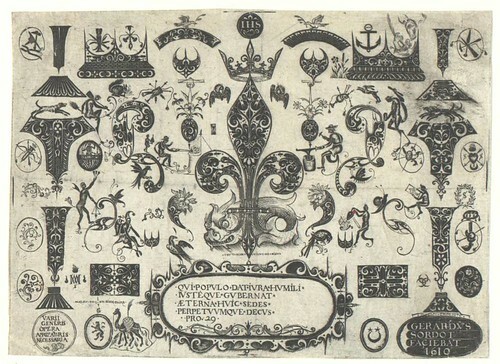 Blackwork engraving (1610) by Gérard Sordot of numerous ornaments and grotesque figures, entitled: 'Opera Varii Generis Aurifabris Necessaria'; confirming that the motifs were intended as designs for goldsmiths. Print made by Heinrich Raab and published by Paulus Fürst in Nuremberg in 1648. The plate features five blackwork fillets from a suite of six design prints for goldsmiths and enamellers. 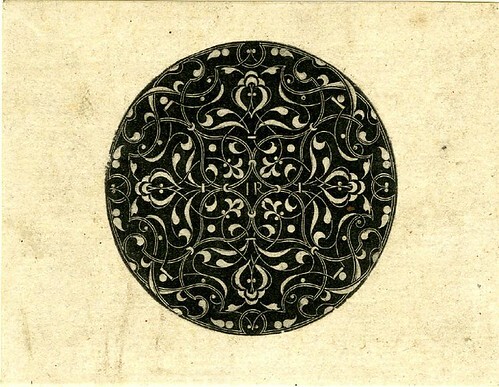 Lozenge and roundel blackwork designs by Michel Le Blon, 1605. 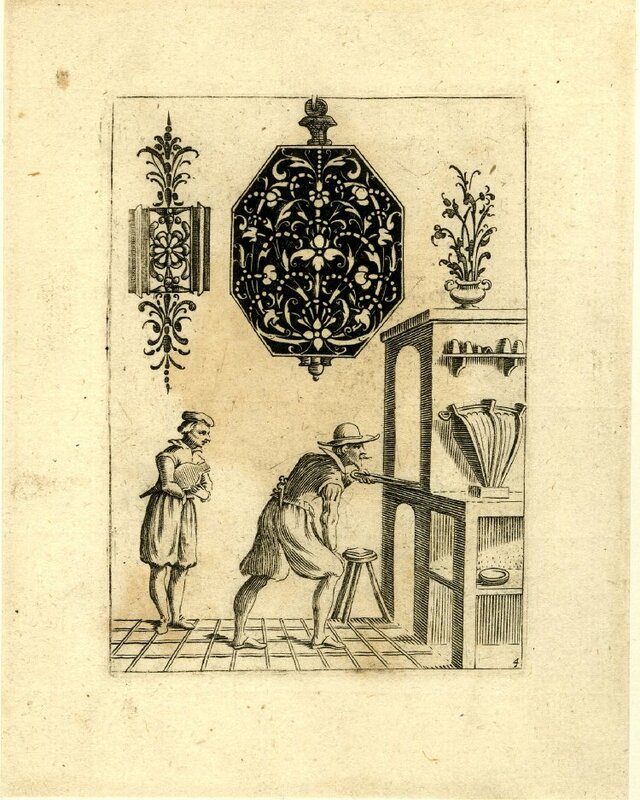 "Dutch ornamental and silver engraver, goldsmith, publisher and art agent active in Amsterdam, Antwerp and London; cousin of Joachim von Sandrart [..]; Theodor and Johannes de Bry were his masters; travelled to Italy, visiting Bologna, Florence and Rome and afterwards to London; died in Amsterdam in 1656." Goldsmith ornaments by Giovanni Battista Costantini, ~1610-1620. 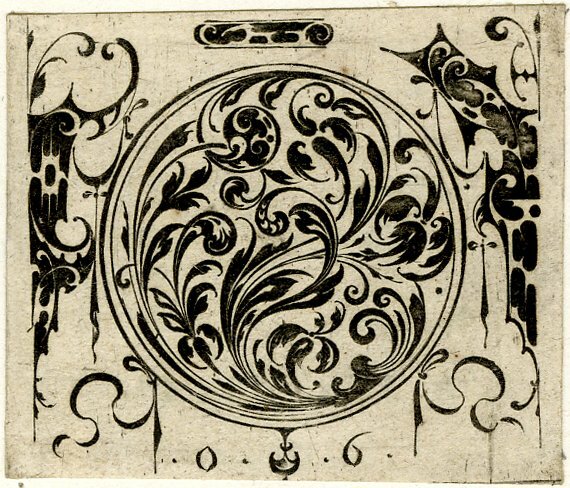 Costantini was one of only a couple of Italian artists to have taken up the technique of blackwork engraving, perhaps after seeing a suite of prints published in Rome by an itinerant Dutch goldsmith/printmaker. Print by Valentin Sezenius, 1623. The angel appearing to a shepherd; two dogs sheep seated to left; blackwork with small silhouetted figures; angel hovering above holding a scroll inscribed 'GLORIA'. Print by Valentin Sezenius, 1624. 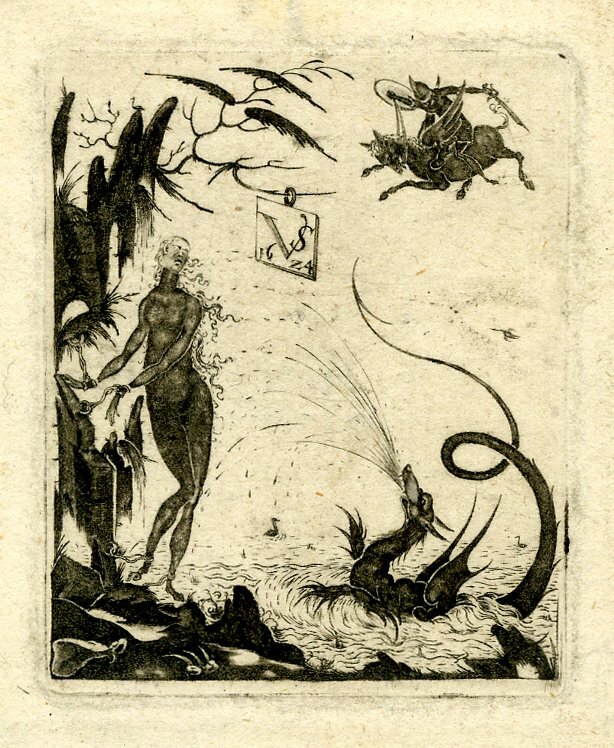 Perseus and Andromeda, the latter chained to a rock, dragon in the sea to right; Perseus on flying pegasus arriving from the right; artist's monogram and date in a tablet hanging from the tree. Ornamental engravings constitute a large and diverse body of prints in which decorative motifs for use by artists and craftsmen in fields such as book illustration, furniture making, architectural and jewellery design, for example, are recorded. Blackwork prints are a very specific and limited group of ornamental engravings, exclusively providing enamelling designs for jewellery makers. 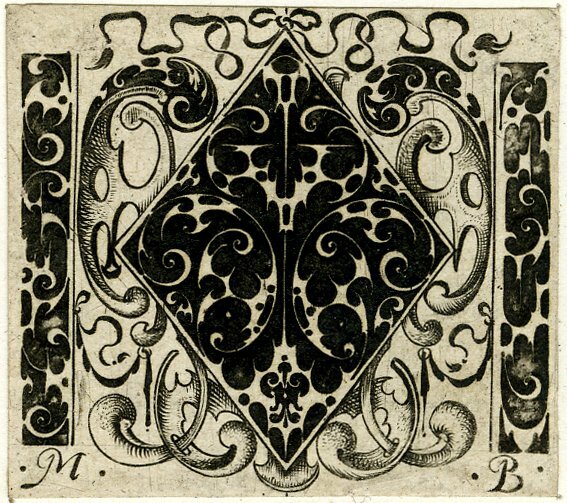 This type of print was produced in Northern Europe (mostly Germany and France) between about 1580 and 1630. The fairly obvious characteristic that identifies a blackwork engraving is the inclusion of solid areas of blackness, as opposed to a normal engraving in which the motif is formed by fine lines from a burin. 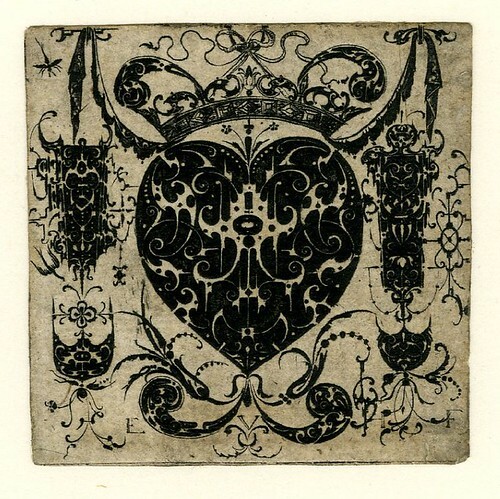 But blackwork prints often incorporate elements engraved in the traditional way as well. The variation in engraving technique almost certainly resulted from goldsmiths having taken up the art of printmaking. Examination of surviving copper plates shows that the surface cuts were likely produced by the same tools goldsmiths used to prepare precious metals to receive enamel. The blackwork engraving on the harder copper metal was undoubtedly a laborious process, restricting its use to goldsmiths familiar with the trade tools. The quality of the prints varied too, as a thicker ink was required to adhere to the wider gouged impressions in the copper. 2. Foliated scrolls -- these lack the interlacing of the arabesque and more closely resemble the classical acanthus ornament or rinceaux. 3. The grotesque -- the monstrous and fairy creatures, trophies, abstracted birds and insects etc. The odd, somewhat geometrical, shapes in some of the above images represent specific elements of decoration for (most usually) rings and pendants, including ring shoulders and hoops, bezels, frame scroll-work and claw-stone settings. Prints were often embellished with naturalistic scenes (these were ultimately dominating features in later prints), in addition to the enamelling designs, both to animate the composition and perhaps, too, as a means of making the work more attractive when artisans showcased their portfolio for potential customers. In fact, printmaking by jewellers was, for instance, a means by which itinerant workers might find employment as they travelled around, because some cities' guilds restricted the numbers of tradesmen who were allowed to work as jewellers. 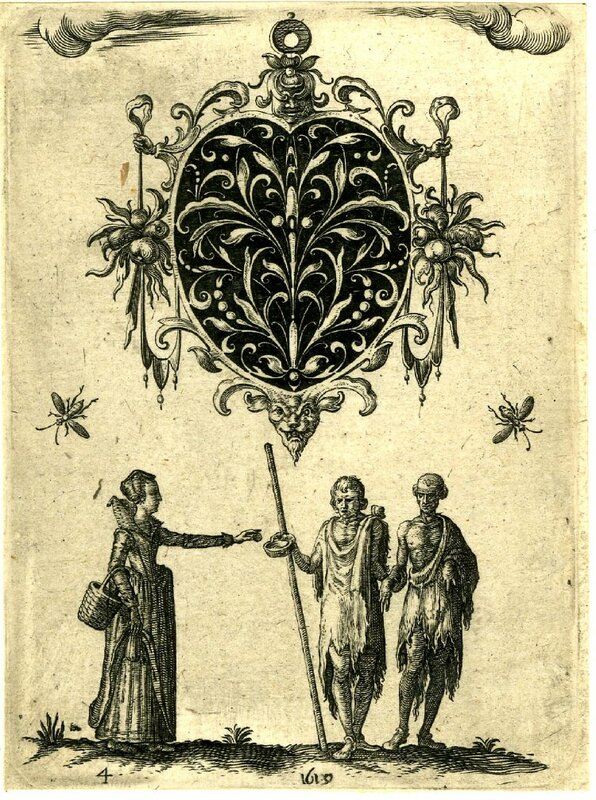 Blackwork engraving had all but died out by the late 1620s, ostensibly as a result of a change in jewellery fashion. Painted enamel decoration superseded inlaid enamel and design prints could be produced by regular engraving more easily. Stone cutting techniques also improved, shifting the decorative emphasis from enamels to clear, cut stones in less ostentatious settings. My curiosity about blackwork prints was originally piqued by some of the highly detailed sword hilt designs that featured here a couple of months ago. The vast majority of the images above are from the British Museum Prints Database - search on 'blackwork'. All of the BM blackwork prints plus many, many more can be found in the Ornamental Prints site - search on 'schwarzornament' and choose the MAK results in the sidebar (the others are only viewable as thumbnails). There is very little of the actual jewellery around today. The pendants and rings were produced as relatively inexpensive items for purchase by the middle classes. As they were not overly valued, they were probably melted down or discarded as the fashions changed. gorgeous images.. you find the greatest stuff! Highly inspiring! I particularly like the "grotesque panel"-- thanks so much for posting these! It's too bad the jewellery isn't available to compare. It's hard for me to quite imagine these as jewellery. 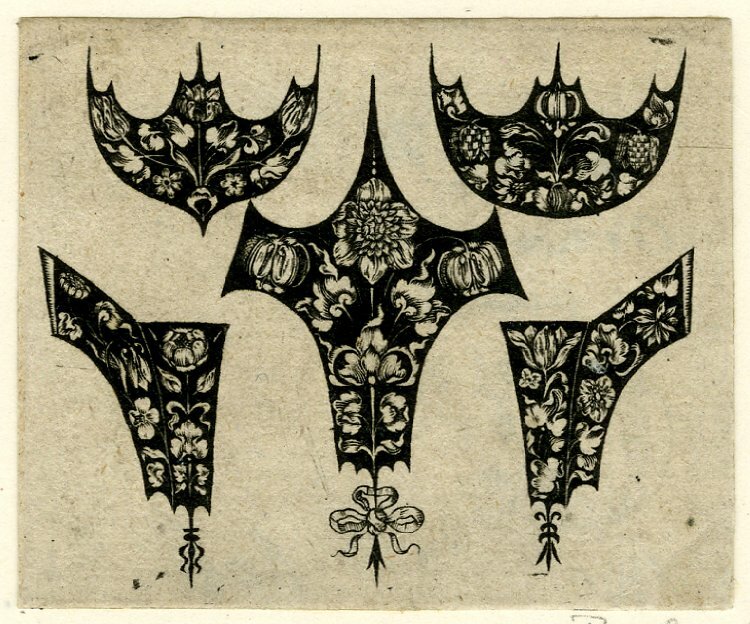 I don't suppose there proved to be any connection to blackwork embroidery. It doesn't look like there would have been other than the name. Yeah, I couldn't find any on the V&A site. That may be due to them not using 'blackwork' as the operative term (previously 'niello' or 'en silhouette' were used I believe) or they just haven't digitised or at least photographed them or whatever. I uploaded the 3 examples from the Robyn Christie article: one, two, three -- but they don't give too much of a feeling of connection to the prints. Or at least, the shoulder elements around the stone mounting in the rings are pretty well identifiable anyway I guess. And no, there is no connection to the embroidery blackwork at all. This confused me a lot until I'd read the Christie article. I'm familiar with niello, but mainly from Minoan art although I'm sure I've seen plenty of other niello in museums. The miniature case is the only one of the jewellery designs that really leaps out as having a connection to the prints, although I can see it on the rings too. I wonder what the V&A library has on this... last time I went to the V&A I did check out their library briefly and it looked impressive. If nothing else, I was able to access various connoisseur-type databases that universities don't normally subscribe to. Auction data and so on. I'm new to this site and blogging in general, but came across your page and it is wonderful! I love this type of stuff! Thanks for all the information....you have my wheels turning! Rebecca, you obviously mean the previous post: The Ballets Russes. And yeah, I guess so. At least there's no giant cannon between her legs. These jewellery are absolutely beautiful! I dont know a lot about these designs but wow, very cool. I wish i was that creative! These are truly exquisite. It was very helpful to include the visuals from the Christie article because, like Karla, I found it nearly impossible to imagine these designs as jewelry. 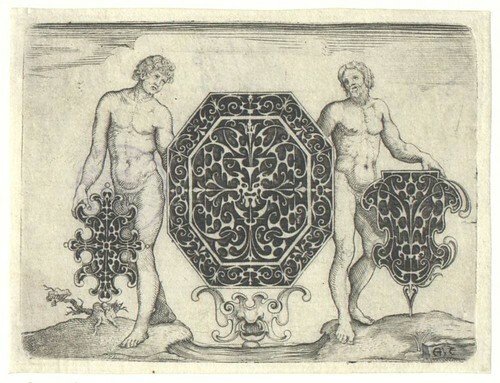 A question about one of the surrounding figures, in the fourth illustration (captioned "This print and the one below were made by Jakob von der Heyden, after designs by Jean Toutin"). What is that fellow on the left doing? From the position of his hands one would think he's bowing a musical instrument but the instrument looks like an open frame, and the "bow" is double like a tuning fork. I assumed it was whimsical rather than serious music making. I agree it looks more like a tuning fork and some sort of cooking frame or the somesuch: dude is just having a good time. I like your blog and am following it. Thanks heaps! A fascinating blog. Thank you!